It is a constant speed or variable speed pressure boosting package that handles flow rates up to 1600 GPM at working pressures up to 300 PSI. 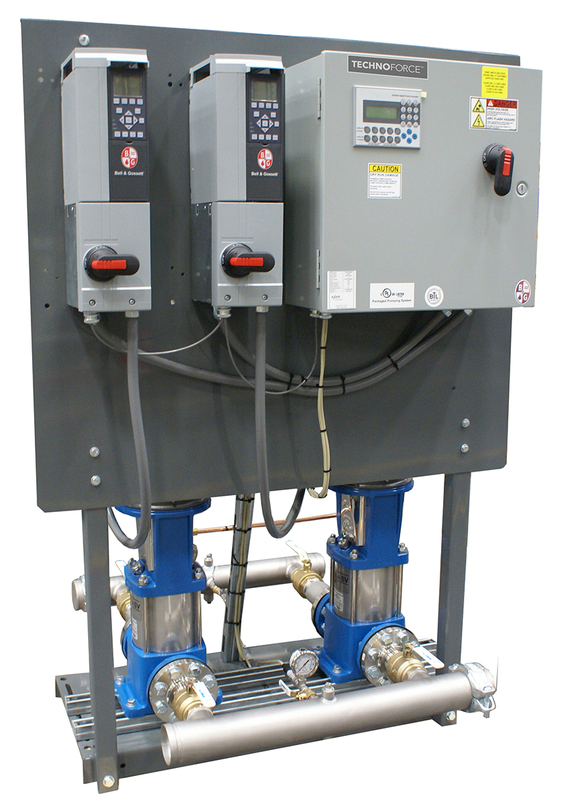 The Technologic Constant Speed pump controller provides reliable control of up to 6 parallel pumps. The TechnoForce VS Controller with ABB variable frequency drives can operate and control up to 6 horizontal or vertically mounted parallel pumps. Stainless steel vertical multi-stage or end suction pumps are used on these NSF-61 (certification pending) packages. The system can be enabled to run automatically from the keypad, remotely via a “dry contact”, or via Modbus, Johnson N2 and BACnet MS/TP (certification pending). To boost water pressure in commercial buildings to meet the flow and head requirements during the day and night. Hot and/or cold water pressure boosting applications for schools, hospitals, and high-rise, large and small residential and commercial buildings, etc. Selection of pumps, controls and various options done through ESP DESIGN PLUS. Quotes, pump curves, specifications and other documents are generated using this same tool.